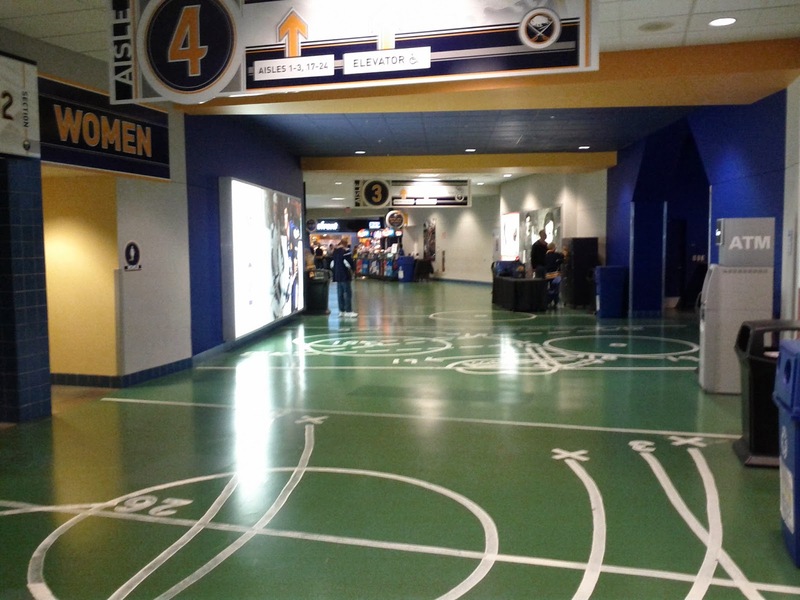 Attending my first game at the First Niagara Center, the home of the Buffalo Sabres, I was curious as to how different the game day experience was compared to Ottawa. Here are my observations. 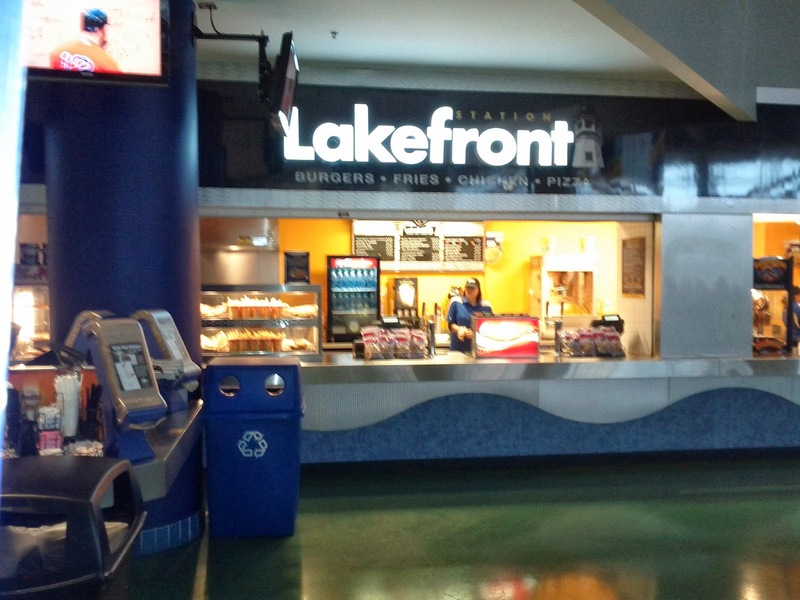 A common complaint of the Canadian Tire Centre is how it's located in the middle of nowhere (Kanata) with nothing to do. I can confidently say that the arena in Buffalo is no better. There are plenty of buildings, but nothing of interest to a tourist. 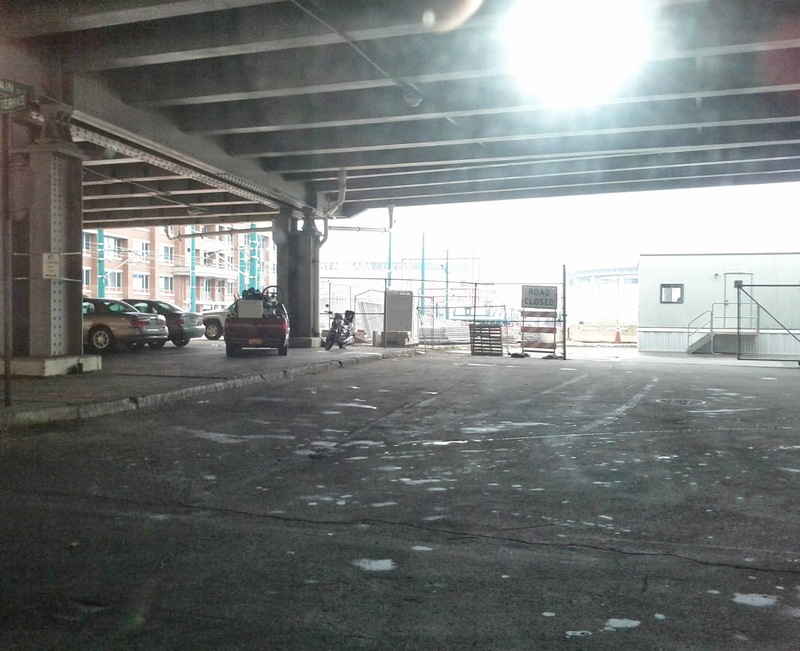 Here's a beautiful view from just outside the arena. 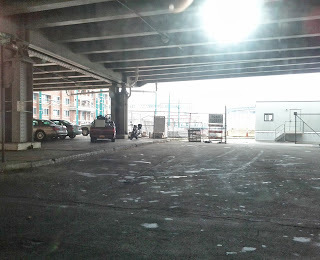 After we found a parking lot to park in (which was a difficult task), we exited the car and began to walk towards the arena when my friend exclaimed "That was Brent Wallace!" as he pointed towards a car that had just passed us. Turns out it was as we watched as he got out of the car. 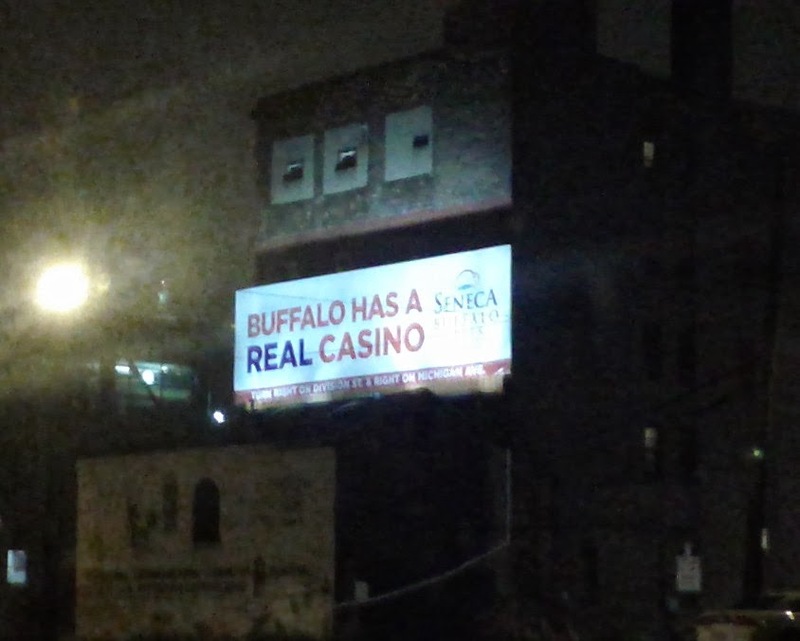 Looks like Buffalo doesn't provide a media parking lot! 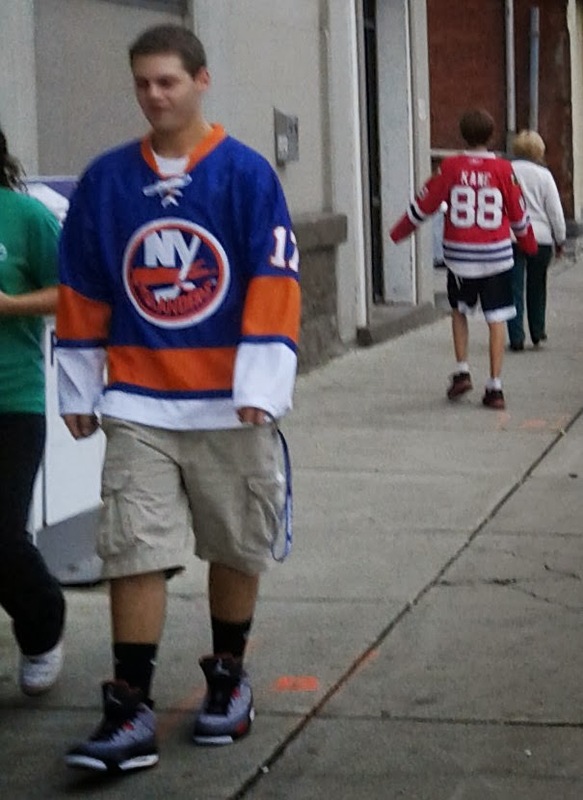 Continuing our walk to the arena, we got slightly confused as to what game we were going to when we passed these two. 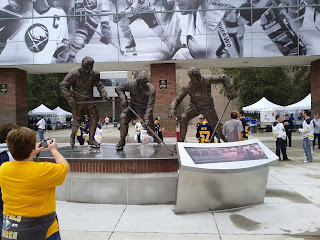 Outside the arena, the Sabres have their own statue featuring the French Connection line. I personally can't wait to see the Sens erect a statue for eventual Hall of Famer and Sens legend Daniel Alfredsson. The main lobby of the First Niagara Center is probably double or triple the size of the CTC. You take a flight of stairs just to get up to the 100 level, and another set after that to reach the 200/300 level. 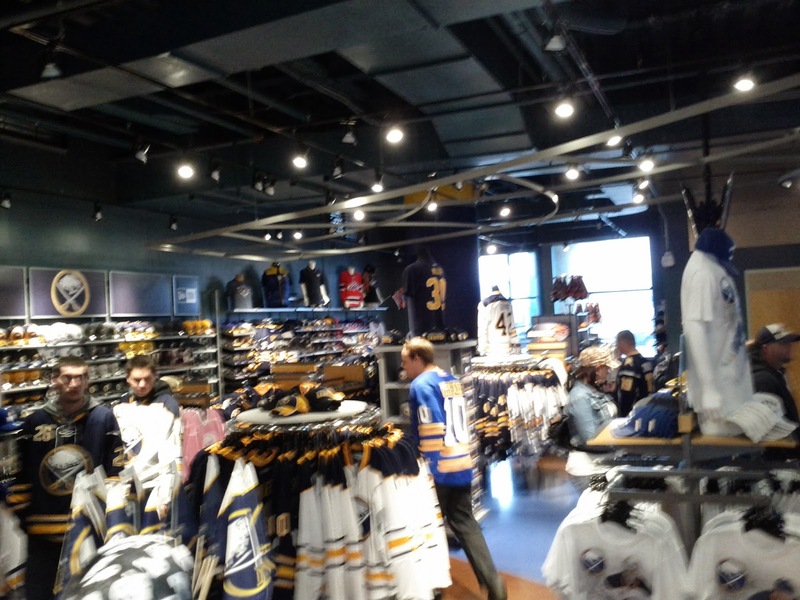 The team store is at least four times as large as the main Sens Store and features a much larger selection as well (Editor's note: Although there's no sign of that beautiful 3rd jersey yet). One thing I noticed specifically is the fact they carry the authentic (with fight strap) stitched jerseys, which the Sens do not. 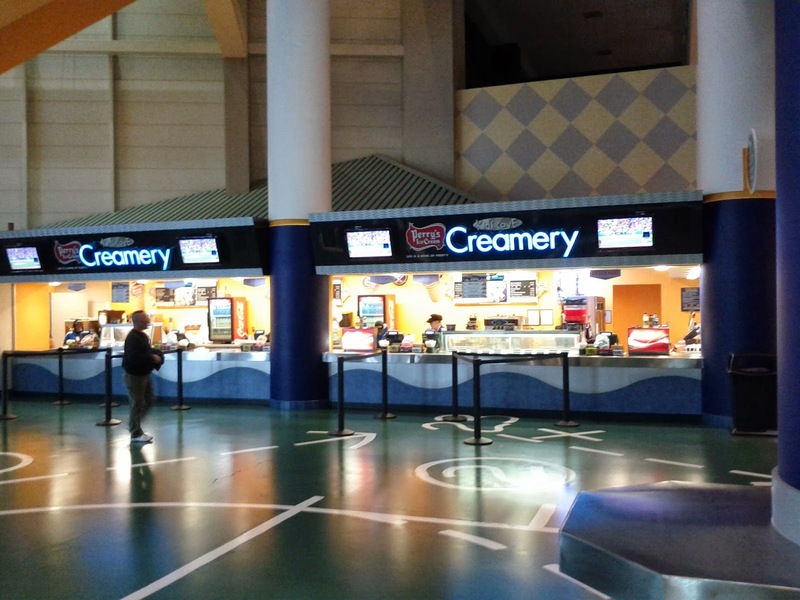 Entering the 100 level concourse, the first thing I noticed was how much roomier it was compared to the CTC. 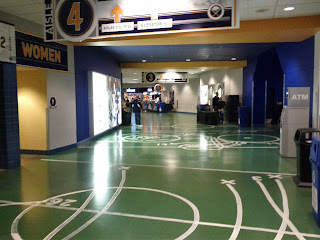 The hallways were wider and there were locations that broke off into eating areas so people wouldn't block the hallways. 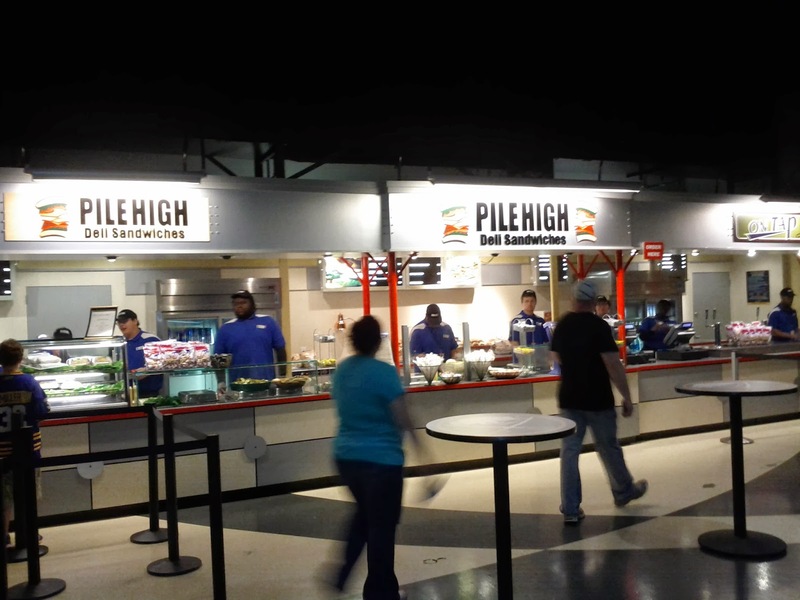 I also noticed how much better the food selection was compared to the CTC (which is probably hindered by its relationship with Aramark). Oddly enough, the Sabres found it necessary to honour one of the Sens' goaltending greats. 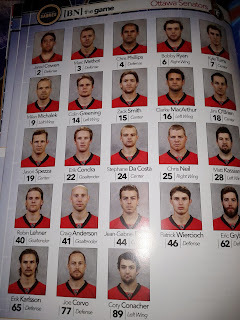 The team also provided a free program (similar to the Score magazine the Sens used to hand out). 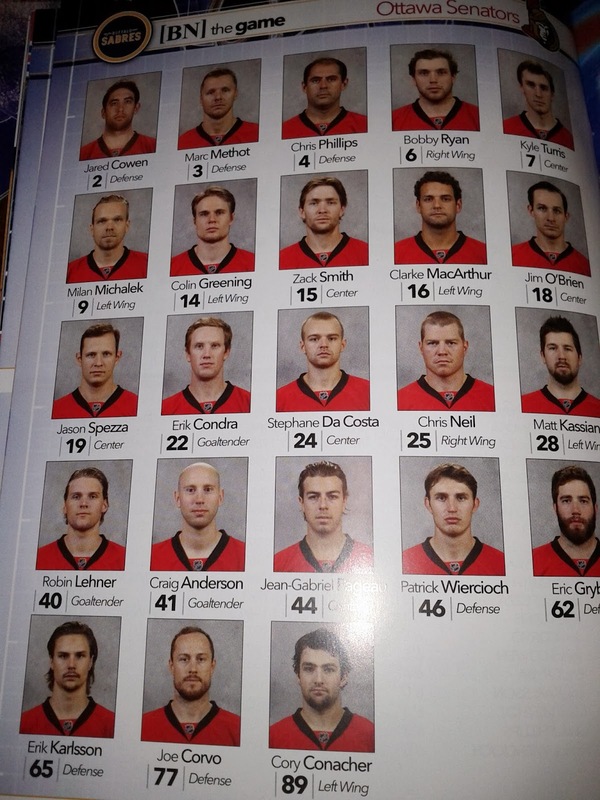 It included a lineup page featuring all the #Fearless faces of the Ottawa Senators. Curiously enough, it excluded Mika Zibanejad, but included Jim O'Brien (claiming the rosters were accurate as of October 3rd). 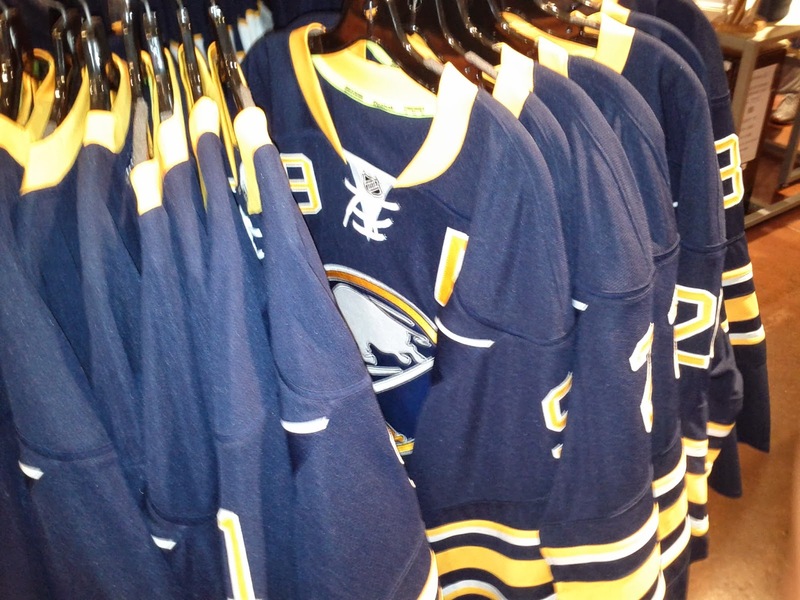 Knowing Erik Condra's defensive prowess, the Sabres also decided to properly tag his position. For the warmup, we decided to head down to the 100 level visitor's side to watch it. 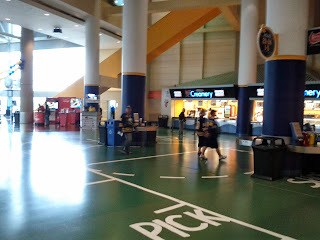 This was the first time entering the rink itself and I was surprised at how large it was. The rink actually had a dome ceiling which really added to the size. 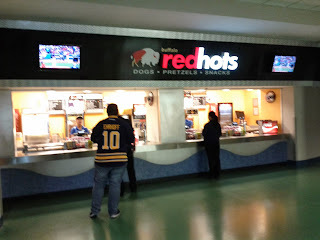 The Sabres also seem to know the Sens fanbase better than the Ottawa Senators organization themselves as they used the proper logo on their score counter. 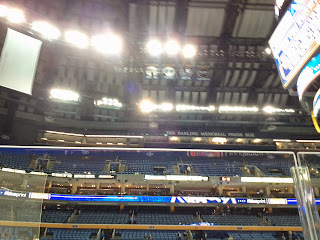 I was able to record a video of the Sens exiting for the warmup. Notice Erik Karlsson's grin as he stepped out on the ice, fully healthy and ready to properly defend the Norris. 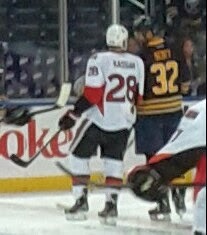 The one interesting thing I noticed during the warmup was that Matt Kassian and John Scott had a good 30 second conversation going on at center ice. Who knows what that was about! 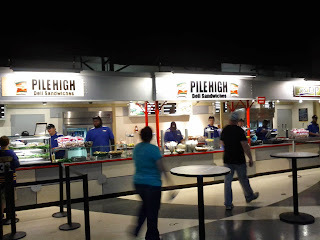 We returned to our 300 level seats afterwards ready to watch the game. 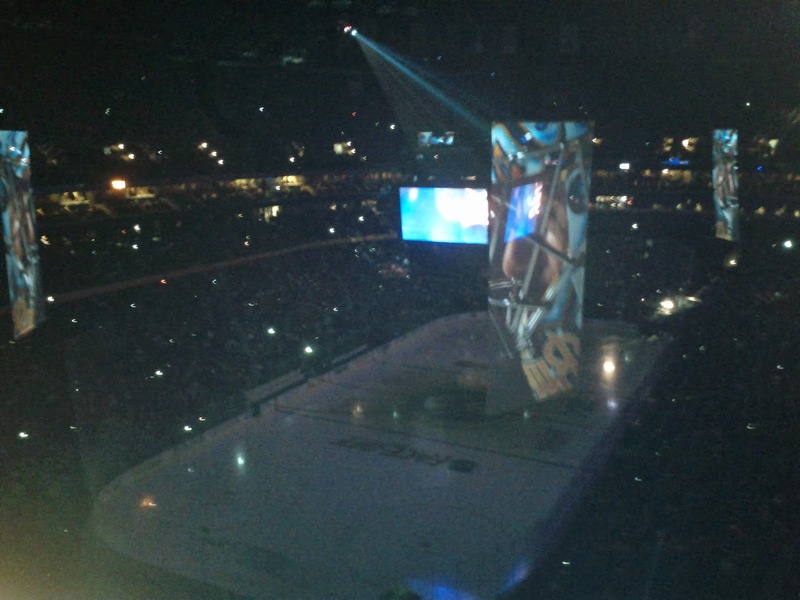 I'll give full credit to the Sabres organization, their intro featured a ton of awesome visual effects with matching music. In fact, it almost made me excited for the Sabres season! 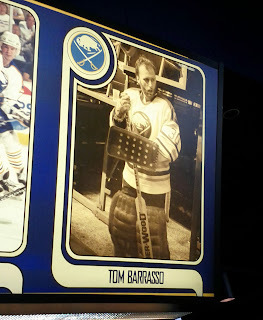 When the first commercial break rolled around I was curious to see what the Sabres did. 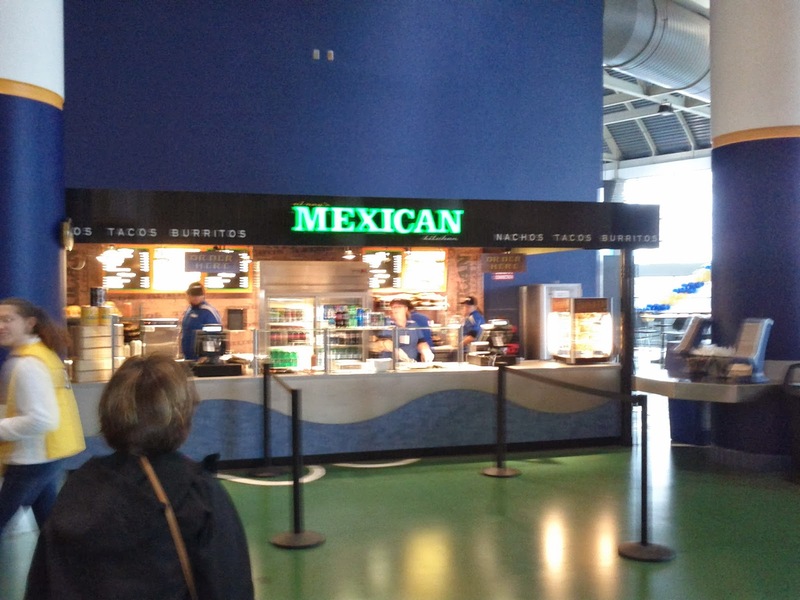 Turns out they do pretty much exactly the same stuff as the Sens organization. However, the acoustics are surprisingly terrible in their arena, leading to nobody paying attention to the jumbotron. This lead to a quiet crowd compared to what I usually hear at the CTC.